This handsome chair is a true classic, to be passed down from generation to generation. The Deerfield chair sits in universities, boardrooms, conference rooms and living rooms across the country. A timeless gift tradition for Deerfield graduates and alumni. 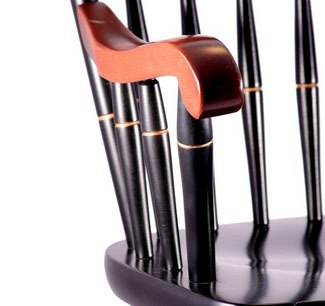 Available in black lacquer with cherry arms and crown, accented with gold or entirely black laquered with gold accents. 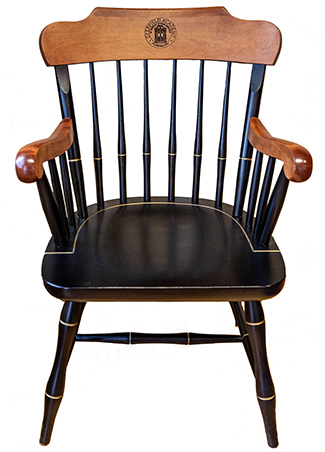 Each chair has the Deerfield seal personalized in intricate detail on the crown of the chair, laser-engraved on the cherry chair or silk-screened in gold on the black chair. Additional personalization is possible by laser-engraving under the seal on the cherry finish or attaching a brass plate on the back of the crown. Laser engraving is not possible on the Black Finish. The Standard Chair measures 18 1/4"D x 22 1/2"W x 34 3/4"H and weighs 28 lbs. 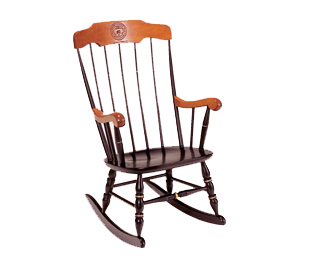 The Boston Rocker measures 18 1/8"D x 23 1/4"W x 40 1/4"H and weighs 27lbs. A beautiful gift for graduates or retirees. Minor assembly required on rocker. Hand-crafted by Standard Chair of Gardner, MA. Allow 4-6 weeks for delivery. Please call for rush options.